Roland Passot's steakhouse on Santana Row delivers prime steak, fine food and accessible wines in a stylish setting. 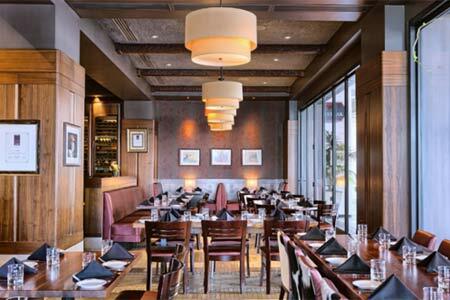 : California grass-fed, dry-aged steaks are the focus at this Santana Row restaurant. But alternatives such as salmon or mushroom and squash risotto should not be overlooked --- not to mention ahi tartare, oysters, Monterey calamari or maple-glazed pork belly with sunny side-up egg. Chef de cuisine Chad Greer relishes adding seasonal spins to dishes such as kale with poached pears and Spanish chorizo. That said, pan-roasted flat-iron paired with rosemary frites comprises a solid luncheon, and the peppercorn sauce makes everything sizzle. A bone-in filet mignon --- essentially a porterhouse without the New York strip --- is a distinctive offering. For a standout steak meal, try the rib-eye on the bone for two (dubbed a "tomahawk chop"), displayed tableside then cooked to order; round it out with creamed spinach and foraged mushrooms. Desserts are rich American comfort fare, like white chocolate bread pudding. The global wine list includes grower-producer Champagnes and an extensive California selection. The attractive, well-lit and heated outdoor dining space is reminiscent of a European café on a pedestrian-only street.